3 Doors Down is an American rock band from Escatawpa, Mississippi, formed in 1994. The band consists of Brad Arnold (vocals), Matt Roberts (guitar/vocals), Todd Harrell (bass), Chris Henderson (guitar), and Greg Upchurch (drums/percussion/vocals). The band rose to national fame with their first single, "Kryptonite", which charted in the top three on the Billboard Hot 100 chart. The band then signed onto Republic Records and released their debut album, The Better Life, in 1999. The album was the 11th-best-selling album of the year and was certified 6x platinum in the United States. Their second album, Away from the Sun, (2002) continued the band's success; it debuted at #8 on the Billboard 200 chart and went multi-platinum in the United States like its predecessor. The band followed it up by extensive touring for two years before releasing their third album, Seventeen Days, in 2005. The album debuted at #1 on the Billboard 200 chart and was certified platinum within its first month of release. 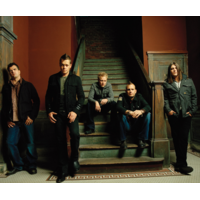 Their fourth, self-titled album, 3 Doors Down, also debuted at #1 on the Billboard 200 chart. The band's fifth studio album, Time of My Life, is due for release on April 12, 2011. The band often performs more than 300 concerts a year and has performed with other artists such as Lynyrd Skynyrd, Megadeth, Staind, Nickelback, Alter Bridge, Breaking Benjamin, Seether, Shinedown and Daughtry. Since the start of their career, 3 Doors Down has sold over 16 million albums worldwide.